The terms of the 3rd bailout deal between Greece and its creditors brought a lot of issues to the forefront. Silly me for thinking negotiations had to with economics–modernizing the Greek economy by enacting needed structural reforms, while providing the Greek government with the fiscal space needed to promote growth and address it’s pressing humanitarian crisis (which said structural reforms would only exacerbate in the short run). Instead, the defining elements of the deal were related to personality and politics. The Germans were mad at the Greeks, so much so that German finance minister Wolfgang Schäuble said perhaps Greece might be better off leaving the Euro–this short-sighted self interest is not suitable behavior for Europe’s de facto leader. Tsipras’s government, for it’s part, apparently did not have a backup plan in case it’s creditors failed to offer a reasonable deal. I know Syriza is new to politics, but you don’t have to be a master negotiator to know that going into negotiations without a backup plan is a flawed strategy. I was a fan of Tsipras’s government because of the interim agreement it secured in February–the potential for trading structural reforms for fiscal space. But since that point it terribly misplayed its hand. It went into negotiations without a backup plan. It held a referendum at least a month too late–the overwhelming “no” vote would have been a strong bargaining chip had Greece been able to take it back to the negotiating table while still covered under the terms of its prior bailout. But once those terms expired, and Greek banks closed, the only choices for Greece were Grexit or capitulation. Since there was no plan in place for a Grexit, Greece ended up with the terrible deal it got. That deal–as it currently stands–fails in all regards: financial sustainability, growth prospects, and short term humanitarian concerns. The I.M.F. is now firmly siding with Greece on the issue. In a reportreleased publicly on Tuesday, the fund proposed that creditors let Athens write off part of its huge eurozone debt or at least make no payments for 30 years. The I.M.F. said in its report that a write-down could be avoided, but only if creditors extended the schedule for Greece to repay its debt. The only other alternative to a haircut would be for the eurozone countries to give Greece the money it needs to repay them. “The choice between the various options is for Greece and its European partners to decide,” the I.M.F. report said. Greece would need to spend a sum equal to more than 15 percent of G.D.P. annually to pay interest and principal on its debt, according to the latest I.M.F. report. The implementation of new austerity measures in Greece amid the country’s deteriorating economic crisis must not come at a cost to human rights, a United Nations expert warned today as he urged international institutions and the Greek Government to make “fully informed decisions” before adopting additional reforms. “A debt service burden that may be sustainable from a narrow financial perspective may not be viable at all if one considers the comprehensive concept of sustainable development, which includes the protection of the environment, human rights and social development,” he added. And of course, as the IMF report highlights, the deal is not even “sustainable from a narrow financial perspective”. Kicking the Can or Letting Heads Cool? If Greece’s creditors, led by Germany, ultimately want to see Greece stay in the Eurozone (for the long run), a friendlier deal is needed. If a “Grexit”, with its short term pain but long term possibilities to return Greece to economic health, is indeed in Greece’s best option given what it’s creditors are willing to offer, why not take that tough medicine and let the healing start? 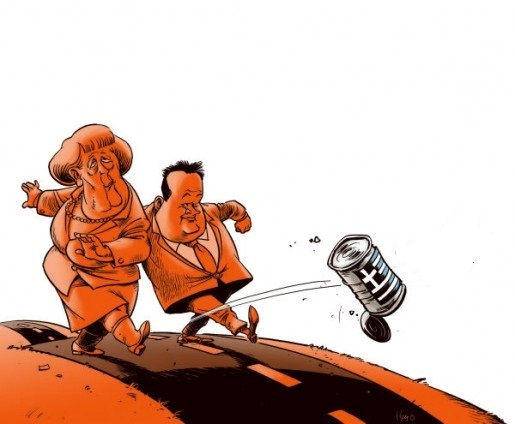 The current deal represents the worst of both worlds–economic pain now and a likely Grexit in the future. The one positive of this deal is that it did buy time, which should not be undervalued as “Grexit” would be permanent and have terrible geopolitical consequences. But without stimulus (there are talks of a 35 billion euro stimulus fund by 2020 if reforms are fully implemented, but this may be too little too late) and debt restructuring (which cannot be ruled out, but also cannot be counted on), the deal is little more than kicking the can down the road–all while the Greek people continue to suffer. Greece’s creditors cannot keep dangling future carrots while imposing fiscal restraints which hurt Greece’s already beleaguered citizenry in the here and now. Aid must be synced with structural reforms, or else the Greeks will see their situation go from terrible to worse and reject the terms of this 3rd bailout. Doing the same thing and expecting different results is the definition of insanity. Greece has tried to implement reforms in order to unlock future aid before, and we see where that got it--a severely contracted economy, depression level unemployment rates, and costly political instability. This is not the time for more business as usual; this is the time for bold action and trust between Greece and it’s creditors. Unfortunately nothing about the past few months of negotiations suggest this is outcome will be realized. Categories: Blog Posts, Economic Outlook | Tags: Austerity, bailout, debt, Euro, fiscal space, Germany, Greece, grexit, haircut, Human Rights, Humanitarian crisis, IMF, Merkel, Schauble, structural reform, Tsipras, unemployment | Permalink.